These days, phones and tablets take great quality photos as good as many digital stand-alone cameras. The problem with great quality is the size of the photo file produced. When trying to send these via email or use them for your website or blog page is that they are very large and slow the uploading process as well as in many cases slow the webpage from loading quickly. To resize a photo quickly can be really easy using many free tools readily available. This tool is basically a screen grabber but has a wealth of tools built in not least a resize tool. Plus it’s totally free so that’s a plus. Opening your photo in this program from either File>Open or right clicking your photo and using Open With>PicPick will get you into the PicPick editor. The resize tool allows you to resize by percentage or an actual size by percentage or in actual pixels. You can save your picture in a number of formats and print it directly from the editor and even email it directly if you use a mail program such as Outlook. 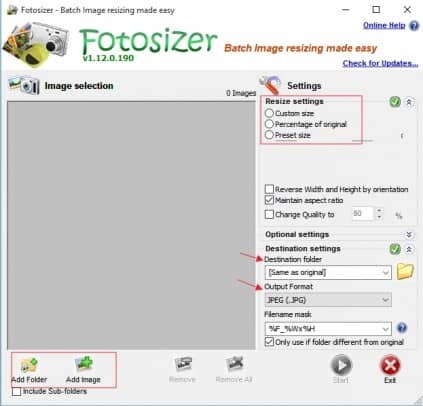 This tool allows batch resizing and even keeps the originals if needed. With this utility you can load a few pictures or a whole folder at once. Save to the same folder as the originals and choose the sizing options, -again by percentage or pixels or cm or mm whatever suits you best.